When it comes to finding a place to meet up with friends to watch your favorite teams battle it out, Chicago is full of plenty of places to go. But the best place by far is a Chicago Irish pub because you’ll have more than just games up on the flat screen TVs. You’ll have a perfectly comfortable place with a fun atmosphere that makes watching the game at a bar more fun than watching at home. Come watch your favorite Chicago sports teams at The Irish Nobleman Irish Pub. We’ve got an excellent location downtown that makes us easy to get to from wherever you are. Aside from location, if you’re wondering how to choose the best Irish pub in Chicago to watch the big game, we’ve got your covered. 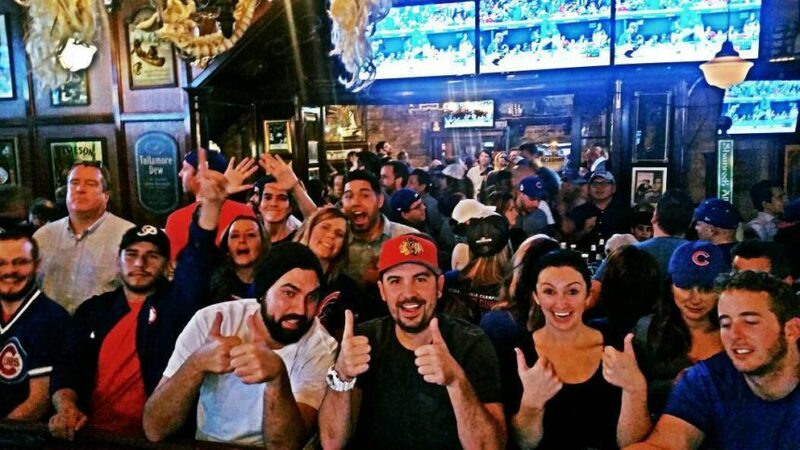 Why is our Chicago pub a great place to be for the game? It’s comfortable and casual while still being classy. We’ve given it that Irish vintage touch with rich hardwoods and exposed Chicago brick for a place that makes you feel warm and welcome when you come in. No weird modern furniture. This place is comfortable with that refined feeling and has a fireplace to help keep you warm. What good is going to an Irish pub if they don’t have enough TVs around the place? There are always games going and you don’t want to go to a place with too few TVs or you’ll be stuck watching a game you didn’t head out into the freezing cold to watch. At The Irish Nobleman, we have plenty of TVs so you can see the game from any angle and never fight over the channels they’re tuned to. Some places only have Happy Hour once a week. We have our Happy Hour every day, even on the weekends. And it’s 2 hours of Happy Hour instead of just one. So come in early before your big game, grab something to eat and drink and stick around to cheer on your favorite team. When you go out to watch the game, you want to be somewhere that has delicious, scratch-made food. That’s what we do here at The Noble Irishman. Our appetizers are perfect for sharing and nibbling on during the game. We have wings, poutine, nachos, and our exclusive Reuben Rolls that you will love! Plus, on Thursdays during Happy Hour, our appetizers are all buy one, get one free! More to love! Is your favorite team playing today? Come on in and grab a seat, grab a drink, and something to eat. We’ll be waiting and ready to cheer with you!